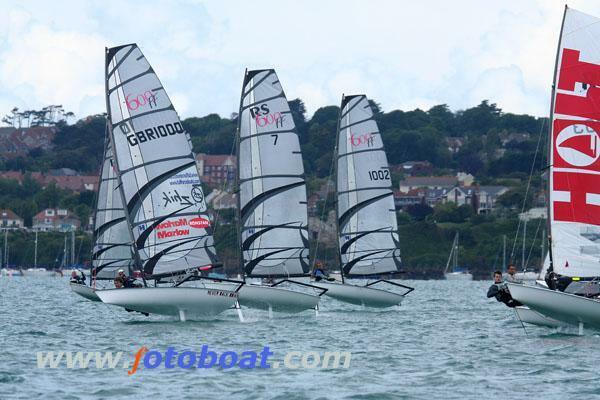 ​The RS600FF fleet descended upon Weymouth & Portland National Sailing Academy for their second National Championships. Some of the helms arrived early on Friday for a practice sail and it was a typical warm June day and about 14 knots of breeze. This made it a lovely day for a sail with a bit of training and boat swapping included and we all hoped that this weather would continue throughout the weekend. Unfortunately the weather took a turn for the worse and the fleet was met by a cold wind of 20 knots. This led all of the fleet (except current Champion Sam Pascoe) to use the reduced rig and by the time the first race started the wind had increased to 23 knots and gusts of over 27 knots, but this did not deter the fleet and after a few postponements the race got under way. Sam Pascoe led for a while before deciding to head to shore for a rig change and this left Simon Hiscocks, Alex Tobatt and Alex Knight to fight it out for first place. Simon Hiscocks was the eventual winner with Alex Torbutt second and Alex Knight third. Steve Birbeck was the first Master to finish in sixth place. The second race started and Sam could be seen back on his way out to the race area but would he make the start?! The race got under way and there was a very similar sequence at the front with Simon, Alex Tobatt and Alex Knight at the front. Unfortunately Alex Knight’s sail became damaged and he was unable to continue . Simon and Alex Tobutt were at the front with Steve Birbeck third (master) and Gareth Davies fourth. But at the end Sam, after a slight late start, managed to make his way through the fleet and the race finished with Alex Tobutt 1st, Simon Hiscocks 2nd, and Sam Pascoe 3rd, with Steve Birbeck 4th. By the third race the fleet had only lost one boat due to breakage so definitely a good advert for the boat's stamina in high winds, especially as the Moth fleet has already returned to shore to see if they could club together enough cash to get the beers in - after a bet was made on Friday night in the bar, that a Moth would catch the RS600FF fleet even though we started three minutes before them. Race three got under way with Sam Pascoe and Simon Hisocks having a close battle at the front for line honours, whilst behind them there was a similar battle for third place with Steve Birbeck, Alex Torbutt, Gareth Davies and Stuart Appleby. Steve Birbeck built up a lead going in to the final lap only to go in to multiple capsizes which then allowed Gareth Davies through to the finish. Final results were Simon Hiscocks 1st, Sam Pascoe 2nd, Gareth Davies 3rd, Alex Torbutt 4th and also Steve Birbeck 4th. After Day One the results were; Simon Hiscocks 1st, Alex Tobutt 2nd, and Sam Pascoe 3rd - and in the master series; Steve Birbeck was 1st, Dave Smith-White 2nd, and Graham Simmonds 3rd. Stuart Appleby had also had a consistent day of sailing with 5th, 6th and 6th. The wind had dropped for Day Two and everyone moved back to full rigs and by the time the of the first start the wind had dropped to barely foiling weather. This did not stop Sam and Simon continuing from where they left off and Alex Knight was also in with the front runners. Graham Simmonds (Master) showed the rest of the fleet the way round with Dave Smith-White (Master) also getting in to 4th position. The race finished with Sam Pascoe 1st, Simon Hiscocks 2nd. Alex Knight and Graham Simmond took 4th ahead of Dave Smith-White. After a delay to allow the breeze to build and change direction a few times race two got underway in a light but foiling breeze, and this allowed for some close racing with Sam leading from the start and Alex Knight and Simon Hiscocks giving chase. The close pack behind consisted of Dave Smith-White leading, Graham Simmonds, Gareth Davies and Alex Tobutt. As the race continued the wind became shifty and patchy across the race course. The race finished with Sam 1st, Alex Knight 2nd, Simon Hiscocks 3rd, Gareth Davies 4th, and Alex Torbutt 5th, with Graham Simmonds leading the Masters home. Going in to the last race Sam Pascoe or Simon Hiscocks could both still win the championship but it was going to be close. At the beginning of the race Gareth Davies, Alex Knight and Simon Hiscocks all headed off on port tack on the foils, whilst the rest of the fleet could only watch. However, with the dying breeze, when they tacked there was no wind and they got headed and rounded in the middle of the fleet. With Sam in the lead this was enough for Simon to head for the shore so this resulted in Alex Knight 2nd place and Henry Clarke in 3rd, using a old style sail. Graham Simmonds was 4th and the first master across the line ahead with Steve Birbeck in 5th. This meant that Sam Pascoe had won the Championship again this year, but with the class growing and attracting more and more sailors of all standards and ability, and with Sam’s training programme and openness to help any member of the class who knows what will happen next year.